An interdisciplinary panel featuring HSU faculty and community members host the talk “Syrian Refugees: Escaping the Horrors of War, Coping with World Apathy” on Monday, Feb. 27, 6 to 8 p.m., in Founders Hall Rm. 125 on the Humboldt State campus. The event is free and open to the public. 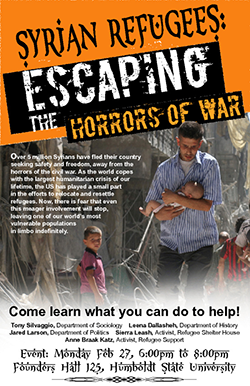 The talk “Syrian Refugees: Escaping the Horrors of War, Coping with World Apathy” takes place Monday, Feb. 27, 6 to 8 p.m. Since the outbreak of civil war, over 5 million Syrians have fled their country seeking safety and freedom. The panel will discuss the US’s roll in relocating and resettling the refugees and what potentially lies ahead as the humanitarian situation unfolds. The panel includes HSU faculty members Tony Silvaggio, Dept. of Sociology; Leenah Dallasheh, Dept. of History; Jared Larson, Dept. of Politics; and community members Sierra Leash, Activist, Refugee Shelter House and Anne Braak Katz, Activist, Refugee Support. This discussion will focus on the context of the crisis and international migration policies. “We will also engage the audience, answer questions, and think about ways our community can help,” says Professor Dallasheh. Thursday, March 2, 7 p.m.